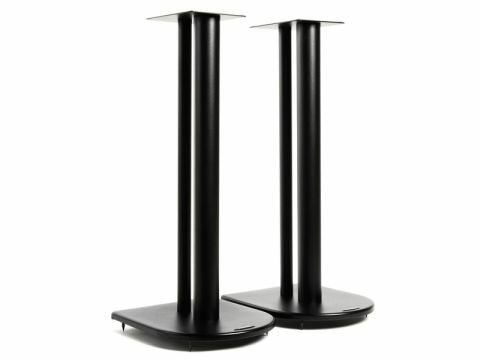 A brand new design from Atacama, the Duo 6 is so-called because of its support pillars. The front one, 50mm in diameter, does most of the mechanical work, while the 25mm rear is principally there as a cable conduit. To that end, large holes have been made in its rear so that even quite large speaker cables can be easily threaded inside and fished out again at the other end, making a substantial contribution to the listening-room tidiness. 50mm may not sound very large for a main support, but the assembly is quite rigid overall, aided by the braced base (quite large at some 300 x 250mm) and the rather small top-plate, at 170 x 130mm, evidently targeted at some of the smaller loudspeakers around. It also works well enough with large models, as long as one is careful with positioning. Filling up the main pillar with damping material is both possible and recommended, but filling the rear one with anything that could spill out is impossible because of the holes. We enjoyed using this stand, although, if we’re brutally honest it’s probably not the least resonant we’ve ever encountered, but its character is slight and by no means destructive. It adds a hint of vibrancy to the sound of all the speakers we tried on it and although there is a very minor reduction in the precision of inner detail and image depth, it’s easy to overlook these. What might bother some listeners a little is a small degree of inconsistency in the bass, which can sound full but occasionally a little indistinct. Still, the life and energy in the midrange and treble will provide ample compensation for most listeners and we were particularly struck by the neutrality and homogeneity of the tonal balance, from upper bass upwards.